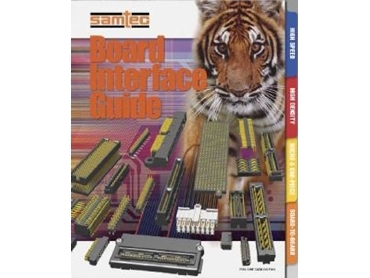 Samtec’s Board Interface Guide catalogue. SAMTEC has announced the release of its new Board Interface full line catalogue, F-203. This new catalogue has been expanded to include the company's Design Concept Guide that provides more than 320 pages of applications, specifications and ordering information. The catalog is tabbed into eight subsections including high speed, high density, micro & one-piece, board-to-board, micro-rugged & power, micro card, cable and sockets. New high speed products include Q-UP (HSC8 Series) interface cards for elevated high speed board stacking, shielded high speed connector sets (QMSS/QFSS Series) and high data rate cable (EQCD Series) assemblies. The micro-rugged line of hermaphroditic connectors has been expanded to include options on .5mm (.0197") pitch (LSS Series), 2mm (.0787") pitch (LS2 Series) and 2,54mm (.100") pitch (LST Series). New features and options have also been added to Power-Mate and Mini-Mate board connectors and discrete wire sockets. Many standard flex cable data links are now available, and Samtec's custom Flex Circuit and end-to-end Signal Integrity capabilities are detailed in this new catalogue.